The B1-HV sCVD Diamond Beam Loss Detector is optimized for high intensity beam losses and high radiation levels. This detector has a separate high-voltage input for the bias-voltage supply. 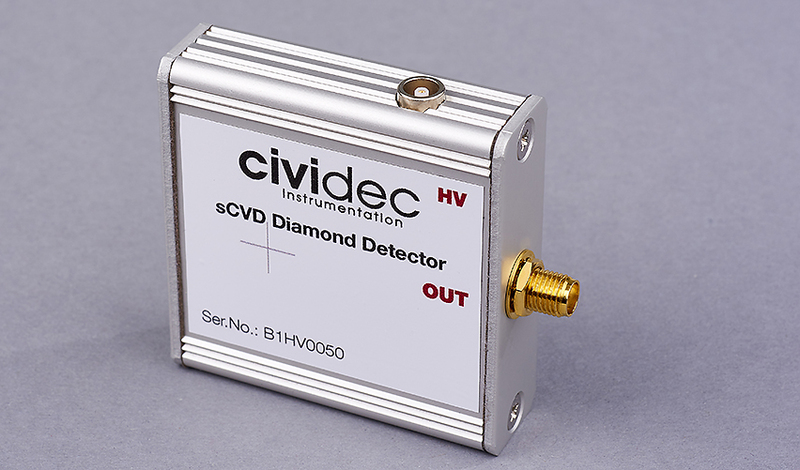 The B1-HV sCVD Diamond Beam Loss Detector can be used for AC as well as DC readout. Charging capacitors are implemented to compensate for the detector discharge at high ionization levels. The B1-HV detector is in use as beam loss detector at the LHC at CERN. The B1-HV can be used and optimized for various applications. For UHV vacuum applications, we can provide a specified ceramics packaging for this detector. B1-HV in combination with the C2 Broadband Amplifier is used for fast beam loss measurements with a very high intensity dynamic range. Bunch-by-bunch loss measurements are feasible using this system with time resolution in the sub-nanosecond range. Fast timing measurements were applied with the B1-HV detector at the CNGS experiment at CERN, Geneva/Switzerland, in 2012 to help clarifying the famous 'faster-than-light neutrino anomaly' which puzzled the international scientific community at the time.